Tooth Decay: We know its main culprits. Now, we need to talk about “Host Factors”. In dental school, we are taught that tooth decay is caused by 4 main factors: sugar (substrate), bacteria (within the plaque), time of contact, and lastly, ‘host’ factors. This involves an a complex relationship of intertwining factors, with each factor having sub-factors affecting it. Going into this topic alone will take up at least 3 lectures (from my memory as a dental student). However, out in practice – we, dentists – have often taken a reductive approach to the problem. More often than not (in say, 90% of cases), some of the above phrases ring true. Sugar, especially, is the main culprit. Step into any supermarket and any food you buy from the shelf will contain sugar. To further compound the situation, sugar acts as an addictive to the brain. This causes a snowball effect in which people find themselves seeking out “something sweet” every other day. But what if you are a conscious of your sugar intake, brushes and flosses regularly each day and yet end up being told you have decay still? Cue: “host factors”. There are plenty of host factors to talk about. Mouth-breathing for example, is a big one. Mouth-breathing changes many things in the mouth. It dries up the saliva, making it more mucous-like, effective reducing the amount bathing the teeth. This reduces the buffering effect of saliva and reduces the pH of the mouth. 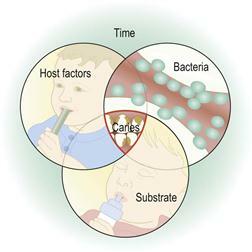 This change in the environment is favourable for bacterial growth which sets off the whole chain of decay. Crowded teeth is another one. Crowded teeth has always been a worrisome problem – but mainly for straighter teeth and aesthetic problems. However, there is sometimes more to crowded teeth than it meets the eye. For starters, crowded teeth makes it difficult to clean in between teeth (despite our best efforts). Plaque accumulates and decay happens in this “contact area”. A bite that is incorrect because of crowding also subjects certain teeth to more force than usual. This can manifest as cracks in the teeth, which over time allows bacteria to enter the tooth and decay to start. Last but not least, occupational factors. There are certain professions or occupations to which dental decay might be more prevalent. For example, bakers or chefs who have to continually taste sweet food might have a higher decay risk because of the frequency of sugar consumption. Late-night shift workers might also find themselves reaching for a soft drink or sugar to keep themselves awake. Athletes who constantly sip on energy drinks fall into this category. We do appreciate how hard it is to change occupational factors, but the important takeaway point is that we can reduce or eliminate decay if we can control the other factors causing tooth decay. At Image Dental, we believe that “There is no health without oral health”. If you have any concerns, we are always happy to help.